Hwaen Maekapat Alchemical Kaya Siddhi Ring of Protection and Wealth, from Luang Por Im, of Wat Hua Khao, measuring 1.9 Cm Inner Diameter. Luang Por Im was an olden days Guru Master, born over 150 Years ago, in 2406 BE, and who passed away more than 70 years ago in 2480 BE. Forged using ancient alchemical formulas of metallurgy and empowered with the incantations of the ancient sorcery grimoires of the lineage of Luang Por Im, the Hwaen Hua Maekapat is a famously powerful ancient amulet of high repute. He was extremely famous for his Takrut, Magic Rings, Nang Kwak, and other 'Lor Boran' ancient style cast metal amulets using alchemical metallurgy. Luang Por Im was known as the Koo Suad, who assisted the great Luang Por Mui, of Wat Don Rai (a great Buddhist master in his own right), in his ordinations as a Buddhist Monk. The ring was made sometime around 2470 BE. The Hwaen Hua Maekapat Alchemical Substance ring is very old and rare, and is famous for its protective power against Dangers, Black Magic and Maha Pokasap to attract and retain wealth and treasures. This ring is quite worn due to its old age, and is recommendable for the devotee with lower budget, who seeks the Magical Power, but who does not seek a perfectly pristine example for competition. 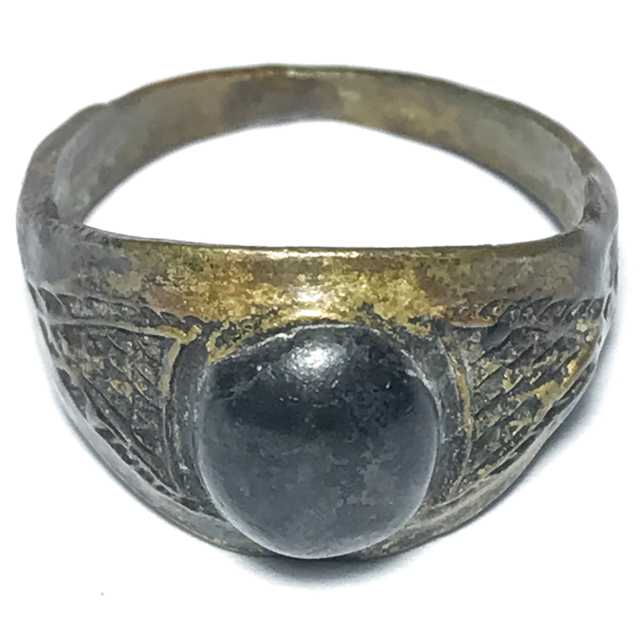 A very rare and highly preferred magic alchemical metal ring using the Wicha of the Ancient Alchemists, to smelt and forge the Sacred Maekapat Kaya Siddhi Substance, using a combination of metallurgy, and alchemy, and the power of incantation. A powerful protective amulet with wealth incrteasing powerrs from Olden Days Miracle Monk, Luang Por Im, of Wat Hua Khao. The Hwaen Hua Maekapat is forged from a highly sacred and powerful admixure of alchemical metals and ancient artifacts. The ring itself is formed from alms bowl lid brass, and has a bead of Maekapat Kaya Siddhi Elemental Substance forged into the head of the ring. Nuea Maekapat, is one of two similar Ancient Alchemical Alloys used for Sorcery, the other being 'Nuea Maekasit'. Nuea Maekasit and Maekapat obtained by Alchemically smelting Iron Artifacts, with Lek Lai for Maekapat, and Mercury as the main base Magical ingredient for Maekasit. The substance is empowered by performing Elemental Invocations until the structure of the metal changes, and becomes a sacred Metal of Alchemical Nature. Alchemy and Metallurgy are combined here as one facet of the various aspects of empowerment of the amulet. The Maekasit and Maekapat Sacred Alchemical Metals are not only especially apt for channelling Magical Forces, but also are a preferred substance for aesthetic reasons; Namely, that the surface of maekapat and maekasit, when boiled and transformed Alchemically into its final state, takes on a lustrous tone, that is matt finish. It has the reputation of being able to 'Hnun Duang Chadtaa' (improve Karma and Horoscope, Luck, Fortune, Destiny and Fate). It is also reputed to be able to forewarn of Dangers or Enemies. As a sacred metal for the Creation of Sacred Rings and other Amulets, the Nuea Maekasit and Maekapat are one of the most Apt and Effective material to use for powerful effects. Luang Por Im of Wat Hua Khao, was amn extremely powerful sorceror monk of olden days, whose miracles are legendary to this day. The miracle of the Sala Yai large Dhamma Salon Building was a very well known legend, which tells of the old Sala, being visited by a group of elephant herders with 5 elephants. Another miracle which brought Luang Por Im to world fame, was the 'Miracle of Hnang Hinaw' (slippery skin). There were two enemies known as Ta Hnid, and Ta Pan, who decided to have a duel with swords to the death. Ta Hnid was known to have only one testicle, which is believed to bring Kong Grapan Chadtri Invincibility against blades and projectiles. Ta Pan was the nephew of Luang Por Im. The two enemies met behind the Uposatha Shrineroom of the temple at Wat Hua Khao, and using sharp swords, began to fight. They stabbed and cut at each other without restraint, but no matter how many times they hit the mark with each other, nobody was hurt or cut, by a single blow! In the end they became so tired, and still unable to harm each other, that they gave up, and sat down together in truce, and drank some water. Luang Por Im once had a Looksit (Devotee), who liked to play in Aiamese Fighting Fish Competitions, but who had never won a single competition. He complained about this to Luang Por Im, who told the devotee to go and bring him some Bai Jag Papyrus leaves. The devotee came back with some papyrus leaves for Luang Por Im, who took them, and folded them into the form of a Siamese Fightiing Fish.